You are here: Home / Defense / Is a Concealed Carry Weapon Really Necessary? January 2017: 39 people were killed and 70 wounded in a nightclub in Istanbul. Yet there are countless other situations where the CCW could not have stopped it. When there is a shooter or an attacker with a knife involved, they can be very effective. When we are talking about an attack with a vehicle or a bomb, well, it’s not as easy. March 2017: People were killed and 49 injured when a terrorist mowed down bystanders in a vehicle outside Westminster Plaza and stabbed a police officer to death. There is a process that goes into getting a license to carry concealed. Though each state varies in just how rigorous it can be. I can give you the Alpha and Omega of regulations in terms of the process beforehand. One of the very worst states is Delaware. This small state makes it practically impossible for a person to get a license. Here is the incredible list of things you must provide to be considered for your permit. Have your application published once, at least 10 business days before the filing of your application. Obtain an affidavit from the newspaper company stating that this requirement has been met. Attach the newspaper company’s affidavit to your application. Be sure to use your whole name – no initials – and your home address. Not every state is as crazy as Delaware, but there is always some process involved. One of the most lax is Virginia which requires that you take a course. It’s a discounted course you can take online, or you can use your hunter education course from an approved department of game and fish training course. No matter what state you decide to carry concealed in, your information will be available to law enforcement, and that may or may not be a deal breaker for you. It depends on how much government involvement you are comfortable with. April 2017: Police officers were shot in Champs Elysees, Paris, killing one and injuring two. I can’t imagine why you wouldn’t already have a weapon at home whether you can carry it concealed or not. Then again, some states make it very hard to even own a gun, let alone carry it concealed. That said, the gun you own today may not be the gun you carry. Some people aren’t into carrying a big firearm. You may want something that is tiny like the M&P Shield which comes in at 6 inches long and 4 inches high. How you holster that weapon is another consideration you must make. Do you carry in front, in back, shoulder holster, or a more traditional right-side holster? The location should come down to the efficiency of movement and comfort. How can you best move to grab that gun? You can spend a week looking at the diverse types of holsters. Have a look at some options for one of the more popular guns on the market in this review of Glock 19 IWB Holsters. At the moment of this publication, there are 32 states that offer permissive open carry or permissive rural open carry. Permissive Open Carry – A state that has passed full preemption of all firearms laws, with few exceptions. They do not prohibit open carry for all nonprohibited citizens and do not require a permit or license to open carry. Open carry is lawful on foot and in a motor vehicle. Permissive Rural Open Carry – A state that generally allows open carry without a license, but local restrictions may exist. Some states exempt license holders from local restrictions while others don’t. If your past doesn’t contain some brush with the law or another issue that prevents you from open carrying in one of these states you might be able to walk out the door tomorrow morning with a gun on your hip. Open carry cannot follow you everywhere, but it is an option that will give your gun more time at your side and less time in the safe. June 2017: Man drives into pedestrians on the London Bridge. Three men with knives emerge and begin stabbing people in the area. The attacks on our second amendment are relentless. They will always be, and we must always remain vigilant in our efforts to protect our most important amendment. Whenever you leave home with your weapon, you become part of an elite group that paints the picture of future gun rights. The choices you make will either embolden those who want to take our guns or reinforce the idea that man should be free–free to speak and free to protect himself. I intermingled these terror attacks into the article as a reminder of what terrorism has taught us. We know that it’s everywhere. It shows up in places we do not expect, and it tends to affect those who are vastly unprepared. I hope that you have learned, by now, that the government cannot protect you and the police can only protect you as quickly as they can get to you. While a gun will not protect you from the box truck steaming towards you at 40 mph, it will protect you from the knife-wielding villains that could emerge from the driver and passenger doors. Terrorists are trained to hit soft targets, and we can harden those targets by having a population of responsible gun owners. This is not to say that we need firefights breaking out during every terrorist attack, but I will tell you these CCW holders can and do act as one of our nation’s great deterrents. So, is it necessary? No. With options like open carry, you can just put that gun on your hip. But with a CCW, you have more options and you are strengthening our 2nd amendment rights. Interesting how your references are in countries where personal firearm ownership is prohibited, for an article I presume is targeted for the United States. For crying out loud! If those wishing to obtain a concealed carry permit publish in a newspaper, every criminal in the area of circulations is going to know about it! That’s so stupid I can’t believe it’s required! And if it truly is, the patriots in Delaware need to vote out all the anti-gunner politicians to get the requirements changed! The requirement to obtain a ccw “permit is illegal. The refusal, of those in power positions, to adhere to the constitution is not acceptable. Without any doubt, possession and lawful use of firearms (for instance self-defense etc.) is a RIGHT, not a privilege. Rights do not require permission, only PRIVILEGES require permission. 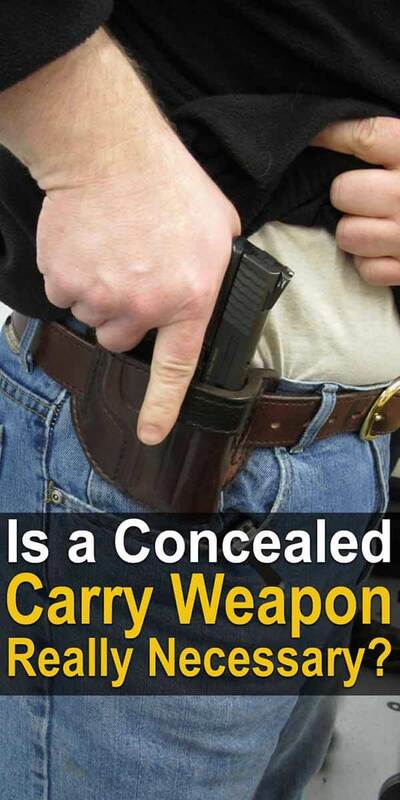 Since carrying a concealed weapon is a RIGHT and therefore do NOT require permission (a permit or license) you strengthen your RIGHT to carry a weapon, concealed or otherwise by exercising that right. You do not “strengthen” a RIGHT by asking PERMISSION as if it is a privilege. Comply with local laws since you’re under duress but do educate others on the origin and differences between rights and privileges so that we can rid ourselves of these unlawful violations of our natural born right to private property (that includes the right to self-defense). Lawful use merely means not infringing on another’s rights. using guns to hold government officials to account for THEIR crimes is included on the long list of lawful uses of firearms. In fact That is the primary lawful use and primary purpose of the second amendment in the first place.